Cable Europe’s Gregg Svingen talks to Neelie Kroes, Commissioner for Europe’s Digital Agenda in exclusive interview on cable, the net and girl power. 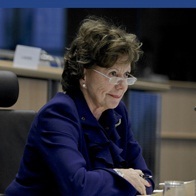 Entering Commissioner Kroes’ space at the European Commissions’ Headquarters in Brussels, it is hard not to notice an imposing brick sitting in the middle of her glass table. A closer look reveals the word ‘Nee’, or Dutch for ‘No’. It’s a helpful reminder about this tech woman’s resolve in executing Europe’s Digital Agenda brick by brick (and a few clicks, too). 1. What are you doing to get more women involved in technology and more generally in business and policy making? I am concerned that not enough women are engaged in this interesting and exciting sector. I am working with my colleagues in the European Parliament and interested Ministers to address this general skills shortage in the sector. In my view, the ICT sector must find a new gender balance if it wants to avoid underperformance. Our goal of “Every European digital” means getting European woman digital too. The issue is not new: over the years, my services have undertaken a number of activities in this area which have led me to the conclusion that we need to work together with business. We have developed a code of best practice which has over 60 signatories from multinationals, academia, SMEs and NGOs and has helped influence the way these companies attract, recruit, train and retain women in this sector. But we still need to do more to get girls into this field. Over the years, the Commission has encouraged different stakeholders to get together and address the issues which have led to women not finding jobs in ICT attractive. The most recent discussions took place during a very successful workshop during the Digital Agenda Assembly held in Brussels in June, and I have also discussed further initiatives with leading members of the European parliament. Have a look at my blog posting. One ‘take home’ message for me from all this work is that we must fight for women without ostracising men in this process. Men are as much part of the solution as women. What we need to do is work out in practical ways how to make computers and ICT more attractive for all. 2. What is your favourite personal technology or application? The Internet. I use the Internet to get my news and to talk with citizens. I am in touch with so many more people because of the Internet – I couldn’t meet them or receive them all in person but now we can exchange our thoughts. 3. What are your views on the future of the IT industry and its role in creating growth for Europe? With a growth rate of 12% the ICT industry is one of the fastest growing sectors of the EU economy. The wealth of this sector very much depends on its ability to invest for its long term future. Today, although Europe is not seen as a leader in developing ICT products, much of the underlying technology comes from Europe in the form of the design and development of the chips and applications that provide the building blocks of modern ICT, as well as leading on embedded systems in other technologies such as the automotive sector. Moreover, there is still a wide margin for growth in Europe in these fields. 4. The Digital Agenda promises a bright future for consumer connectivity. What is the biggest obstacle to your ambitious set of plans? The Digital Agenda does indeed aim to bring a bright future for consumer connectivity: it aims at all Europeans having basic broadband by 2013, for everyone to have at least 30Mbps connections by 2020 and for half of European households to subscribe to bandwidth above 100Mbps by 2020. A bright future and ambitious targets. The greatest obstacle to achieve them is the high cost of ensuring that all Europeans have access to such connectivity. The Commission estimates that achieving the 2020 target will require investment of up to €300 billion and this estimate is supported by the analysis of the European Investment Bank. Europe is facing difficult financial conditions as a consequence of recession and it will not be easy to mobilise such funds. However, we all agree that Europe must invest in world class infrastructure if we are to take advantage of the new opportunities that will arise as the world economies renew growth and the Digital Agenda sets out a clear strategy to encourage investment, promote competition and thereby achieve the targets.